A destructive 35,000-acre brush fire, pushed by strong Santa Ana winds, was zero percent contained Friday night as it burned onto the Pepperdine University campus in Malibu while on a march through Los Angeles and Ventura counties toward the sea. 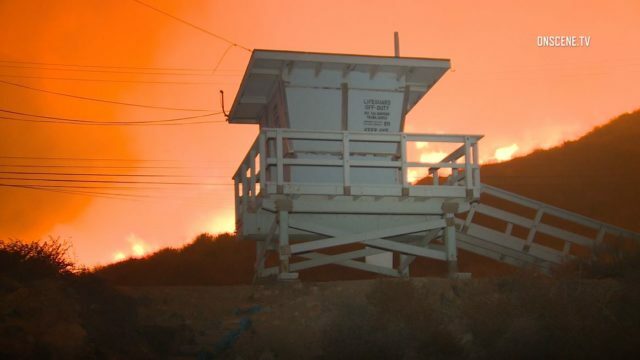 Los Angeles County fire strike teams and water dropping aircraft were working to contain the flames on or around the Malibu campus, according to a statement from the school. No permanent structures have been lost, shelter-in- place protocols remained in effect and all individuals on campus remain safe and are resting in relocation sites, including Payson Library and Tyler Campus Center, the school said. Video from the campus showed at least one vehicle and several bicycles scorched by flames. No injuries were officially reported, but sheriff’s detectives investigated the discovery of two bodies in the 33000 block of Mulholland Highway, but could not confirm whether the deaths were fire-related. Spectrum customers in the wildfire area were without cable and Internet service as repair teams worked to restore service, a statement from the company said. Authorities later ordered mandatory evacuations for the West Hills area in the San Fernando Valley, not far from the fire’s origin. Officials were expected to hold a news conference Saturday morning to discuss when evacuation orders may be lifted. 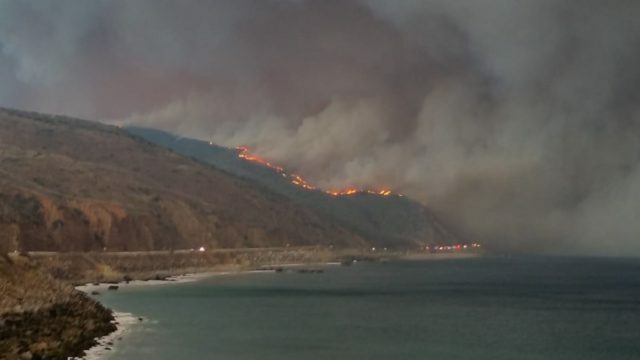 Driven by 50- to 60-mph winds, the flames jumped south across the 101 Freeway in the Liberty Canyon area early Friday, sending it on a course through Malibu and its exclusive celebrity enclaves. TV personality Caitlyn Jenner’s home was reportedly among those destroyed. National Park Service officials reported the famed Western Town at Paramount Ranch, a filming location for hundreds of TV and movie productions, including HBO’s “Westworld,” had burned to an unknown extent. Crews from other agencies were also assisting in battling the massive blaze, helping evacuate residents and providing traffic control. Crews hoped to get a break from the winds Friday night, when a red flag warning of dangerous fire conditions had been scheduled to expire. But on Friday afternoon, National Weather Service forecasters extended the warning through Tuesday afternoon — although some respite from the gusts was expected Sunday. The fire prompted the Friday closure of all schools in the Las Virgenes Unified School District in Calabasas, as well as Viewpoint School, Montessori of Calabasas, Montessori of Calabasas Too and Muse School. Also shut down were the schools of the Conejo Valley School District, headquartered in Thousand Oaks, and the Los Angeles Unified School District’s Topanga Elementary Charter School. It was unclear when those schools would reopen.